Applied To Work At Steak N Shake But Didn’t Get The Job Because Of A Background Check? Steak n Shake, the self-proclaimed “classic” American fast-food chain, has recently come under scrutiny for conducting background checks on job applicants but failing to provide them with adequate disclosures. Some applicants may have been denied employment without having the chance to see their background reports and correct any inaccuracies. It is believed that this practice has the largest effect on applicants with criminal records who are denied employment without an individualized assessment of their qualifications. Federal law requires prospective employers to provide all job applicants with a clear disclosure in writing of their intent to obtain a background report. Employers have to obtain your authorization before they obtain a background report. Background checks often include false information that can frustrate your employment prospects, and the law gives you a chance to correct it. Consequently, employers have to give you notice of their intent not to hire you because of information contained in your background report. You are entitled to a copy of your report at no charge BEFORE the employer denies your application for employment. 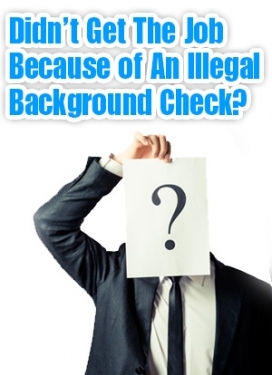 In certain circumstances, you may be entitled to statutory damages if an employer fails to comply with the law relating to background checks. Class action attorneys are investigating whether Steak n Shake’s background check policies violate the law. If you’ve applied at Steak n Shake or have relevant information, we’d like to hear from you.